The author, Kim Severson, rightly characterizes the backyard chicken craze as a fad, like the potbellied pigs of a decade ago. Like any fad, many people jump in head first without acknowledging the risk, commitment, or education and skill involved. Severson rightly points out that a lack of attention to these issues by unprepared and inexperienced owners–as well as the unavoidably strange and unique biological climates that urban and suburban areas contain–often lead to some bumps in the road. In the case of San Francisco, new diseases and other persistent health problems have emerged, and many unprepared chicken owners have begun abandoning their hens and roosters at animal shelters. These unprepared and overly hasty owners have unfortunately given the movement a bit of a black eye. No offense to the people featured in the article–I’m sure they meant well–but they are far from the victims in this story; the abandoned and sick chickens are. Seriously adorable backyard hens in Toronto, Canada. 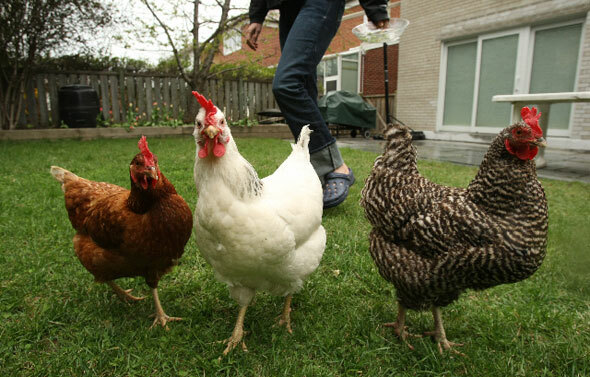 Photo from torontochickens.com via http://www.blogto.com. Personally, I grew up around chickens: picking them up from the post office at 5:00 AM in a loudly chirping, warm cardboard box, raising them, collecting their eggs, cleaning them, and butchering them. I (with my younger brother) even won best in show for the Grant County Fair two years in a row, and have the trophies to prove it! These were, in fact, the only two years we entered, marking a short and impressive reign in Southwest Wisconsin. At any rate, I love chickens! They’re wonderful, intelligent, even affectionate creatures, and if I ever have the time and space to care for them, I’d do so in a heartbeat. I do have an apartment with a private backyard in Brooklyn, and its physically able to handle a few chickens, but still I’d never attempt it here for a few reasons. First, I’m a renter and I seriously doubt my landlord would approve. Elena and I looked at an apartment in Red Hook where the landlord lived downstairs and had chickens in the backyard, but as the chicken owner also owned the building, the situation there was much more friendly. Second, I’m more than a little worried about the microclimate that these chickens would be living in. Brooklyn soils contain a lot of lead and other heavy metals, and anyone who knows chickens and has been around them knows that chickens spend a lot of time with their beaks in the dirt. Granted we all have to start somewhere, and as far as chickens in backyards, go I’m all for this movement gaining ground. It’s a spectacular and sustainable trend, and as soon as I am in a place to participate, I’ll do so! Online communities such as Backyard Chickens and The City Chicken do a lot to encourage responsible urban chicken ownership, and more and more cities are realizing that they are beneficial creatures that should be legalized. It’s clear that we’re headed in the right direction, and this I applaud! But clearly, more education is necessary. We saw this in tomatoes as well, just this year. The blight that affected the tomato crop this year was partly blamed on too high a demand for seedlings by too many amateur gardeners growing heirloom varieties for the first time. This problem, I would surmise, has partly the same roots as the chicken diseases we’re seeing emerge. So, please, if you’re planning on gardening or getting chickens for the first time next year, do your homework! Do more than you think is necessary, or even sane! I’ve seen far too many tomatoes planted in the hard soil of full-shade tree pits in New York, and it really does sadden me every time. There are plenty of skilled gardners and urban farmers dying to warn you about that kind of thing, and you have to listen to them. Thanks!